BullFrog® Tool Wipes are the most convenient form of rust prevention that we’ve found. To use, simply pull a clean tool wipe from the container, rub on the surface to be protected and let it dry. It doesn’t get any easier than that! Other rust prevention methods are less convenient and therefore they are not used as often as they should be leaving the metal surfaces unprotected and prone to rust. Keep a container of Tool Wipes in your shop, garage or shed so you can quickly and easily protect your metal surfaces from rust. BullFrog® Tool Wipes clean and protect tools, parts, machinery, metal surfaces and electronic boards. 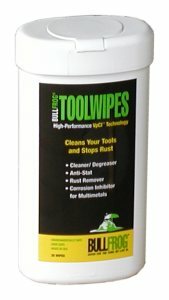 In addition to providing corrosion inhibiting protection, these wipes will also remove light rust and grease from tools, parts or any other metal surface. Environmentally safe. 25 wipes per resealable container. Made in the USA.